Telegraph sounders convert electrical pulses into audible sounds and are used to receive Morse code messages. The message travels as a series of electrical pulses through a wire. Short pulses make a dot, slightly longer pulses make a dash. The sequence of dots and dashes represent letters and numbers. The pulses energize the sounder’s electromagnets which move a lever-arm. The arm makes a loud “click” when it strikes a crossbar and the operator translates the pattern of sounds into the original language. 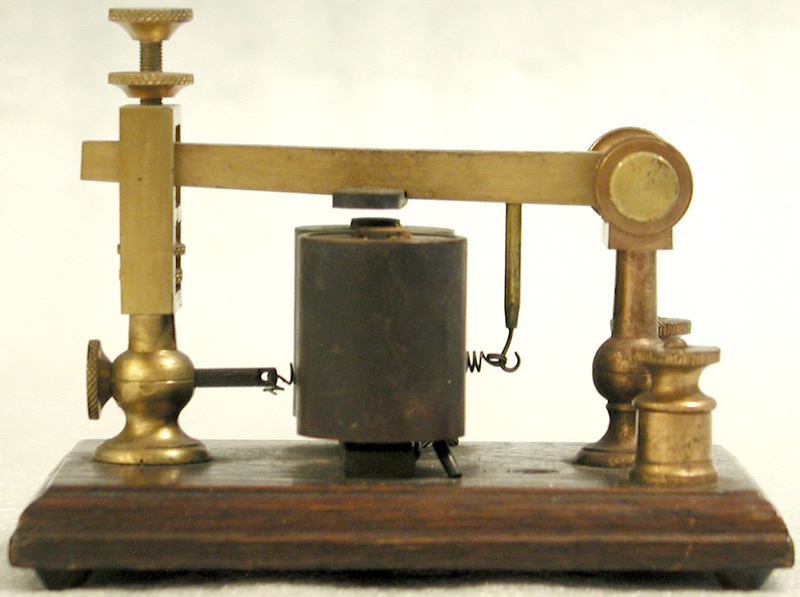 “Telegraph Sounder,” Digital Public Library of America, http://dp.la/item/72d00207c6609998bf267de0b1010198.